Bangalore: Many Indian real estate and construction firms and architects are feeling the heat of a real estate slowdown—in West Asia. Over the past three-four years, developers and construction firms such as the Dheeraj Group, Hiranandani Developers Pvt. Ltd, Ajmera Group and Mayfair Housing (P) Ltd entered markets in West Asia, attracted by relatively low-cost land, rising demand and the scope for striking joint ventures (JVs) with local developers. Engineering and construction firm Gammon Billimoria Plc., a JV between Gammon India Ltd and BE Billimoria and Co. Ltd, had nearly completed the foundation work for eight of the 12 towers of the Forbidden City project at Dubai’s International City when it was informed by developer Nakheel that it would have to suspend work indefinitely. “We were informed that the project has been shelved because the developer was undergoing a cash crunch. We have no idea when and whether it will resume," said a senior Gammon executive, who asked not to be named because he is not authorized to speak to the media. Nakheel is struggling to execute its projects and shelving the ones that are far from completion, said two property consultants operating out of Dubai on condition of anonymity. In an email response to Mint, a Nakheel spokesperson said: “We are witnessing a global negative economic movement and believe we have a responsibility to help this market maintain healthy momentum, which means reassessing our immediate business objectives." The next few months would see a “redirecting of activity" around some of the firm’s projects, he added. Another project, 23 Marina, promoted by Hircon International Llc., a JV between Hiranandani Developers and Dubai’s ETA Star Property Developers LLc., has not been able to attract buyers. Bookings for apartments opened in 2006 at Rs13,000 a sq. ft The price is now down to Rs7,000-8,000. A marketing executive at the firm’s Dubai office said many apartments remained unsold and that the “price was negotiable". He did not want to be named because he is not authorized to speak to the media. On Wednesday, Abu Dhabi deepened efforts to stave off economic damage from the credit crisis, launching a government-backed lender to revive the housing market as major Dubai developers were reported to halt sales. The lender, called Abu Dhabi Finance, would back mortgages to the emirate’s Top 3 developers as a first step, and would extend its reach countrywide into the United Arab Emirates (UAE), the new firm said. The UAE suffered a direct hit from the credit crisis after lending to its booming real estate sector dried up and property prices plunged, forcing the government to create a rescue vehicle called Emirates Development Bank that would serve to consolidate and absorb finance firms under pressure. Separately, newspaper Emirates Business reported on Wednesday that two Dubai developers, state-owned Nakheel and Limitless, which is controlled by government-owned Dubai World, would halt property sales until Dubai’s real estate market improves. It also said Emaar had relaxing restrictions on the resale of properties, allowing investors to sell before paying the firm 30% of the property value. The problem isn’t restricted to developers and to Dubai, although Mumbai-based architect Shashi Prabhu, who has designed projects for many developers in Dubai over the past 32 years, says the crisis is worse in the city because every form of development there is primarily targeted at the expatriate population, which is staying away from real estate investments. “Two of my projects have been stalled due to the downturn," said Prabhu. Bangalore-based Sobha Developers Ltd, which had announced five-star hotels in Dubai and Oman, has also put them on hold and is now concentrating on executing its domestic projects, said a company official, who did not want to be named as he is not authorized to speak to the media. The slowdown has also affected Bahrain, a market that is still new for Indian developers and architects. Architect Raja Aederi’s first project in West Asia, a mixed-development township in Bahrain, has been shelved. “It was a huge project and my first in that part of the world and I am told that the project is not happening now because of the slowdown," said Aederi. Ajmera Group’s managing director Bandish Ajmera, however, said the slowdown had impacted Dubai more than Bahrain, where land prices are considerably lower. Ajmera is developing the $150 million Bahrain Bay project with Mayfair Housing. 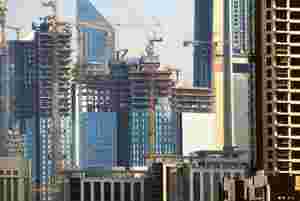 A correction in property prices has just begin with a 25-30% dip in projects in Dubai that are near-completion. Prices will go further down, said Usha Lata Birla, director at Al Firdous Real Estate, a property advisory that operates out of Sharjah and Dubai.